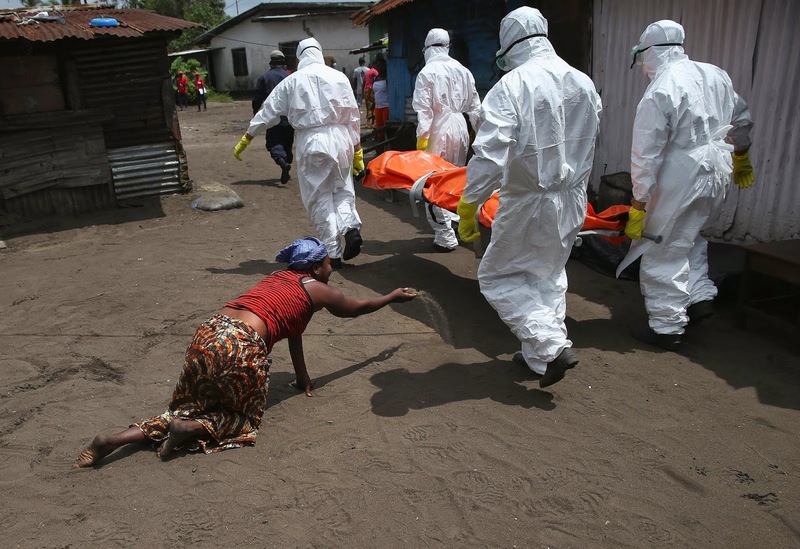 From airplane disasters to the outbreak of Ebola, 2014 saw irrevocable tragedies, causing many to lose their loved ones. 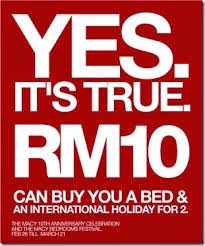 There were also good news like Singapore being Lonely Planet’s top destination and the successful fundraising for ALS. Rescuers continued their grim task of recovering bodies from the crash site of an AirAsia jet in shallow, choppy waters off Borneo on Wednesday, including one in a flight-attendant’s uniform and another wearing a life jacket. 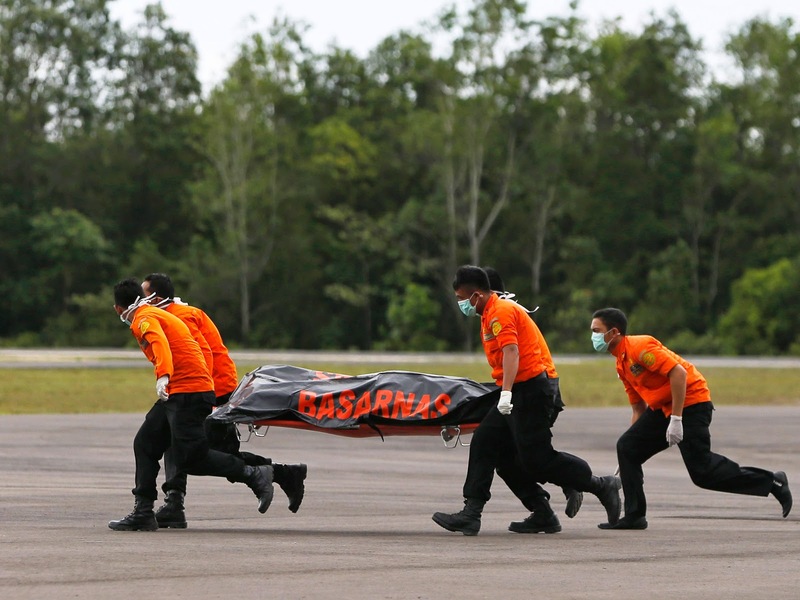 Indonesian search-and-rescue chief Bambang Soelistyo said as of Wednesday morning, the bodies of four men and three women had been recovered since debris of the plane was spotted on Tuesday about 20 miles from the plane’s last recorded position on radar. Six more bodies of victims from AirAsia flight QZ8501 were pulled from the ocean overnight as a team of 50-plus divers hoped that on Friday, finally, they could descend to the crash site. 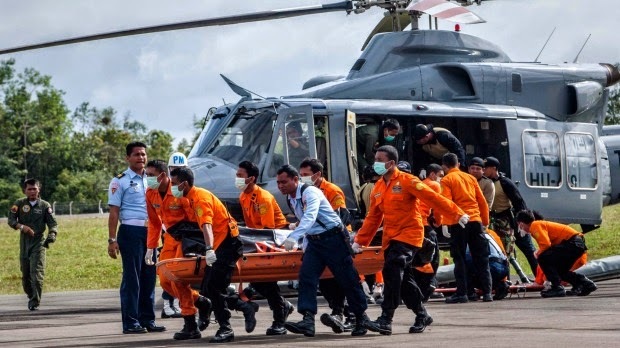 The newly found bodies bring the total recovered to 14 and, like the eight already recovered and flown to Surabaya for identification, were found in a search site away from the main fuselage of the plane, having floated there on ocean currents. 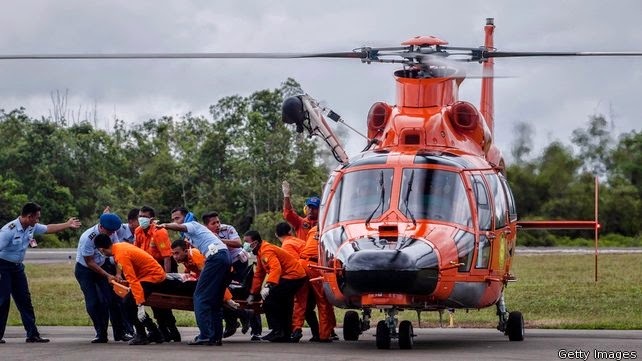 They are due to be evacuated on Friday from the port of Pangkalanbun, the closest to the crash site, to Surabaya, where the families and police identification units are waiting for them. 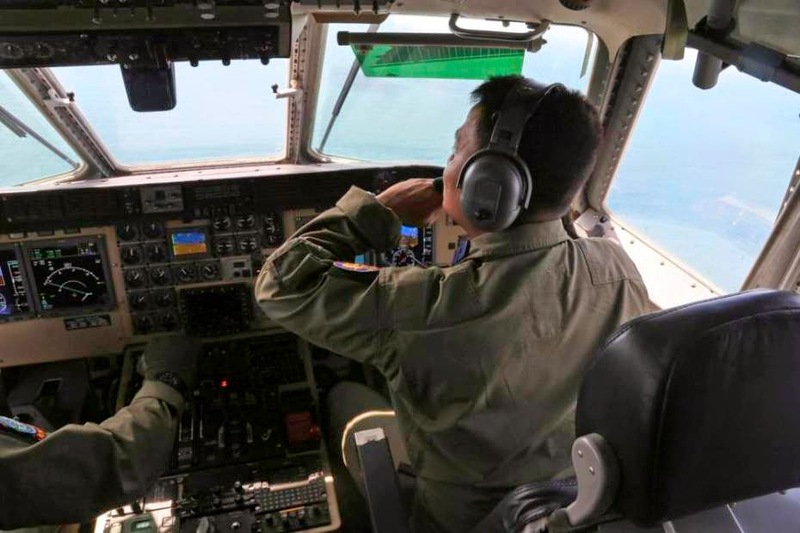 A specialist black box search team sent by the French crash investigation agency arrived in the possible crash area of an AirAsia flight off Borneo early on Friday after heavy seas forced divers to halt their search the day before. 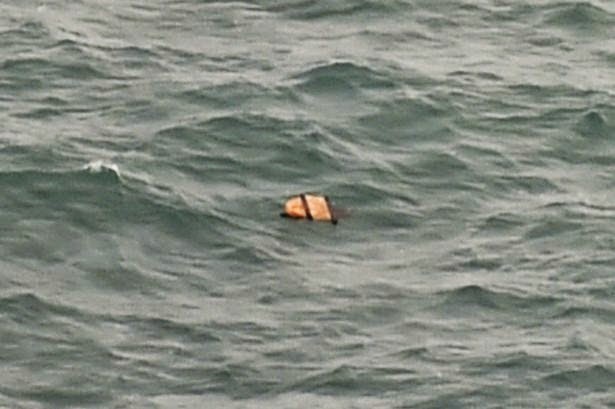 At least one person on doomed AirAsia flight 8501 was wearing a life jacket, it has been confirmed. The discovery of the body raises questions over what happened to the flight as it suggests some passengers may have been alive when the plane entered the water. It was also revealed that Indonesian search officials have now found the fuselage of the plane, upside down on the Java sea bed. They discovered a shadow shortly before darkness in water that is up to 165ft deep. 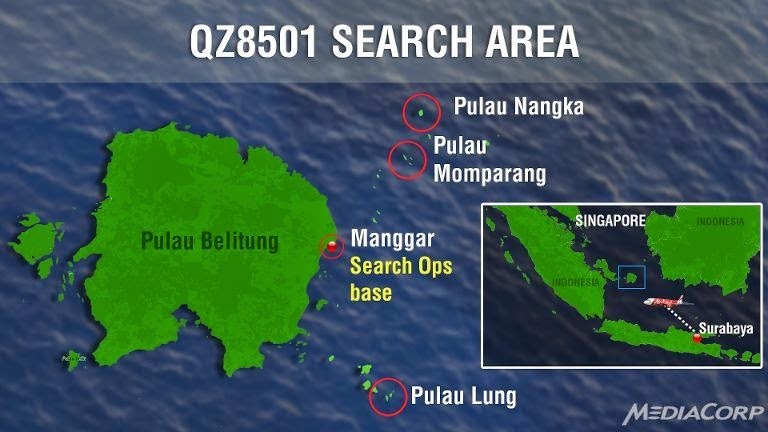 "It seems all the wreckage found has drifted more than 50 kilometers from yesterday's location," said Vice Air Marshal Sunarbowo Sandi, search and rescue coordinator in Pangkalan Bun on Borneo island, the closest town to the site. "We are expecting those bodies will end up on beaches." The authorities say that seven bodies have now been retrieved. According to a Wall Street Journal report, Indonesia's search-and-rescue agency had obtained a sonar image it says may be the body of the missing plane at the bottom of the Java Sea. The newspaper quoted the agency as saying the image appeared to show an aircraft upside down in 24-30 meters (78-98 feet) of water. According to a Reuters report, the discovery of fully clothed bodies could indicate the plane was intact when it hit the water and support a theory that the Airbus A320-200 suffered an aerodynamic stall and plunged into the sea. "The fact that the debris appears fairly contained suggests the aircraft broke up when it hit the water, rather than in the air," said Neil Hansford, a former pilot and chairman of consultancy firm Strategic Aviation Solutions told Reuters. Indonesia searchers have found the wreckage of the plane. According to a CNN report, Indonesia has found the wreckage of the AirAsia Flight QZ8501 at the bottom of the Java Sea with the help of sonar equipment. The report on CNN adds, that searchers added that they "still don't know if it's in one piece or broken up." 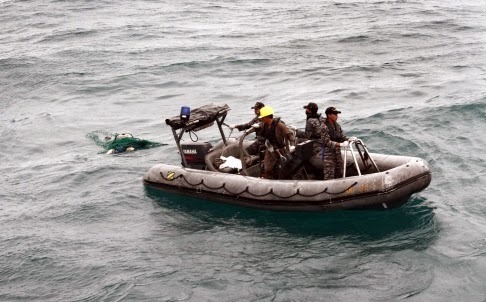 Bodies and debris were found in the area near to where a sonar image is reported to have revealed the underwater mass. Ships and planes have been scouring the Java Sea for the missing flight since Sunday, when it vanished with 162 people on board during bad weather about 40 minutes into its flight from the Indonesian city of Surabaya to Singapore. 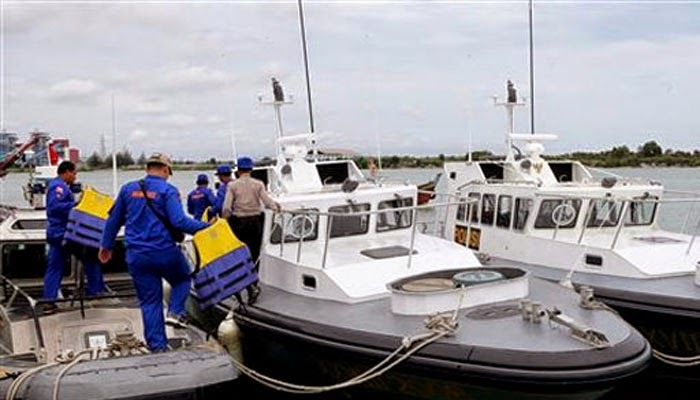 Indonesian rescuers have recovered various items, including luggage, and seven bodies floating in shallow waters off Borneo. “It's about 30 to 50 metres (100 to 165 feet) underwater,” Hernanto, an official with the search and rescue agency, said of the sonar image. A body recovered from the crashed AirAsia plane was wearing a lifejacket, an official with Indonesia's search and rescue agency has said. "This morning, we recovered a total of four bodies and one of them was wearing a life jacket," said Tatang Zaenudin, an official with the search and rescue agency. Indonesian rescuers believe they have found the wreck of the plane on the ocean floor off Borneo, after sonar detected a large, dark object beneath waters where debris and bodies were found floating. detik.com reports that officials said that bodies spotted from the Hercules army plane were of two males and one of a female. "One male was of a man and another of a boy's," said officials involved in the SAR operations until 7pm yesterday. The search continues today at first light of dawn. 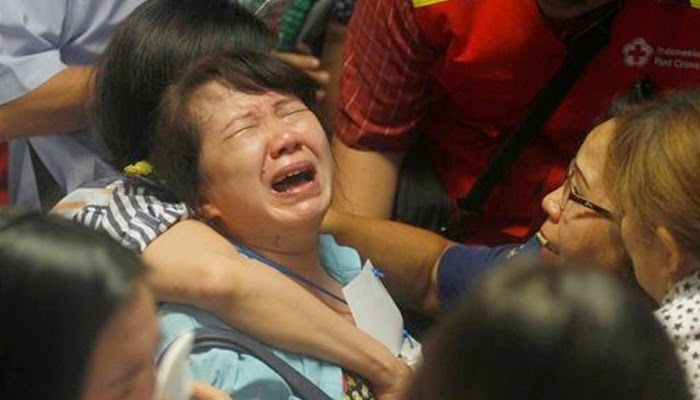 At least two distraught family members were carried out on stretchers from the room where they had been waiting for news in Surabaya, Indonesia's second largest city -- the take-off point for the aircraft that disappeared during a storm on Sunday. Six bloated bodies and debris seen floating in Indonesian waters Tuesday painfully ended the mystery of AirAsia Flight 8501, which crashed into the Java Sea with 162 people aboard and was lost to searchers for more than two days. The bodies were found about 160 kilometres from land and 10 kilometres from the plane’s last known co-ordinates. 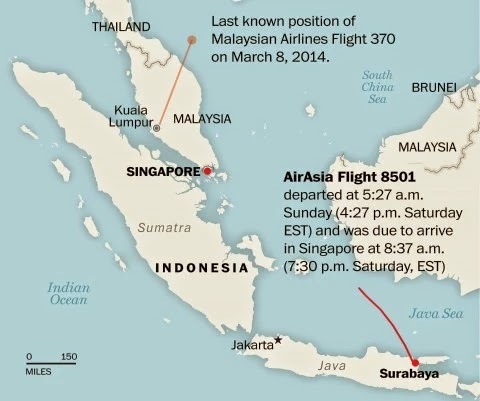 The plane vanished Sunday on its way from Surabaya, Indonesia, to Singapore after encountering storm clouds. The six bodies were recovered, swollen but intact, and taken to an Indonesian navy ship, First Admiral Sigit Setiayanta, the Naval Aviation Center commander at the Surabaya air force base, told reporters. The corpses did not have life jackets on. 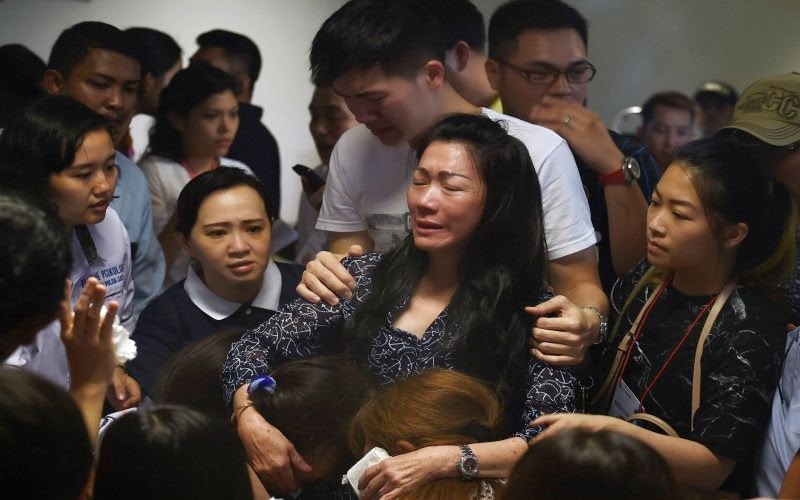 Media stations have been criticised for showing split-screen footage of distraught families as they were watched live footage of bodies from missing AirAsia flight QZ8501 being recovered from the water. 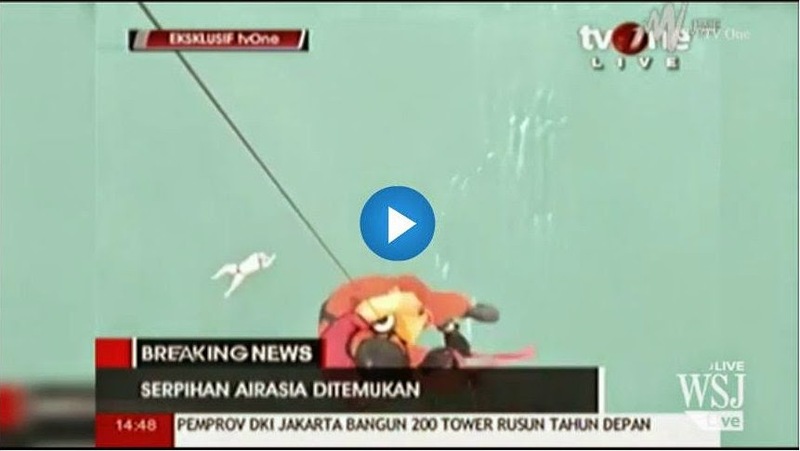 TV One, an Indonesian news channel, screened images from rescue crews as they encountered the debris and bodies found earlier today in the Java Sea, off the coast on Borneo, on a split screen interposed with live reaction from the families of passengers. In Surabaya airport where the passengers' family were gathered in a 'crisis centre', six giant flat screen TVs were reported to have played the footage immediately emerging from the scene of discovery. Chaos erupted at Juanda International Airport’s crisis centre here as relatives of the doomed Indonesia AirAsia Flight QZ8501 watched footage on a local TV station which showed a floating body and debris sighted by the Indonesian Search and Rescue team (SAR) in Pangkalan Bun, central Kalimantan. 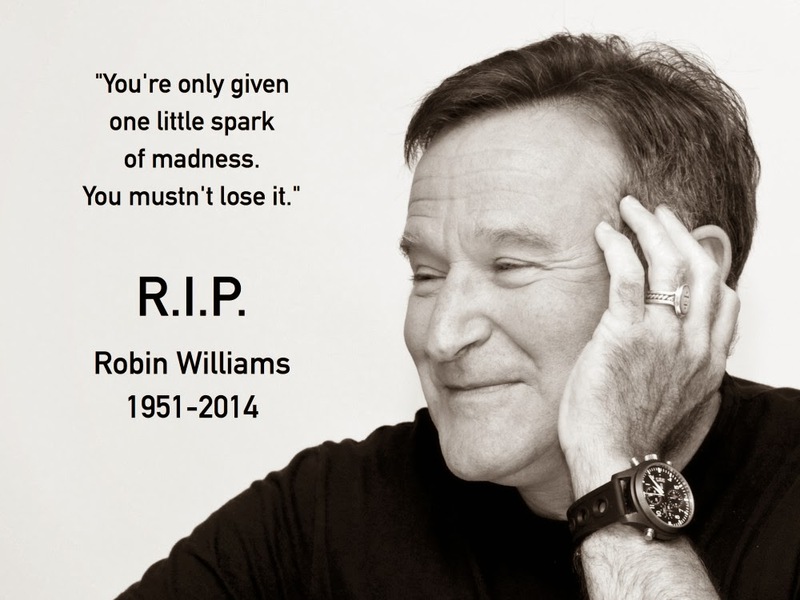 Wailing, screaming and non-stop crying ensued from the distraught and hysterical next-of-kin. One man covered his face and had to be held up by two other men before he fainted and was taken out by stretcher. 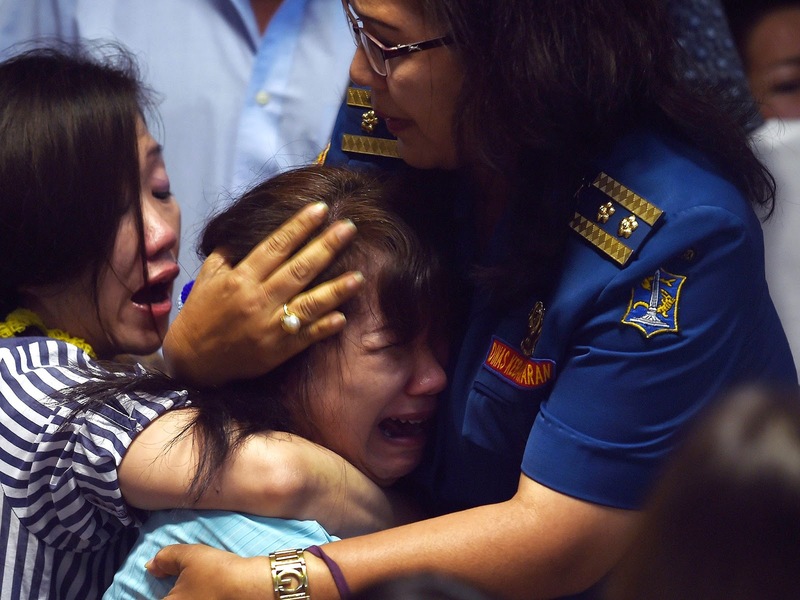 Another woman was screaming and crying as she was supported by the mayor of Surabaya. Indonesian rescuers searching for an AirAsia plane carrying 162 people pulled bodies and wreckage from the sea off the coast of Borneo yesterday, prompting relatives of those on board watching TV footage to break down in tears. 3.15 pm: More than 40 bodies retrieved from AirAsia plane 8501, says Indonesian Navy - Even as the search for missing AirAsia plane 8501 continues, Indonesian navy says they have found more than 40 bodies of those who were travelling in the aircraft. 3.00 pm: Here's a video of search operations for missing AirAsia flight. An Associated Press video shows debris floating in the sea off Borneo Islands. 1.34 pm: 6 bodies retrieved where AirAsia's QZ8501 disappeared - Indonesian officials on Tuesday spotted six bodies from the AirAsia flight that disappeared two days earlier, and recovered three of them, in a painful end to the aviation mystery off the coast of Borneo island. The bodies were found in Java Sea waters about 10 kilometers (6 miles) from Flight QZ8501's last communications with air-traffic control. Images on local television showed at least one bloated corpse. Local media reports from Indonesia say that at least six bodies have been retrieved from the sea. Officials say that most of the debris floating in the sea is of red and white colour - the colour of the missing AirAsia Flight 8501. 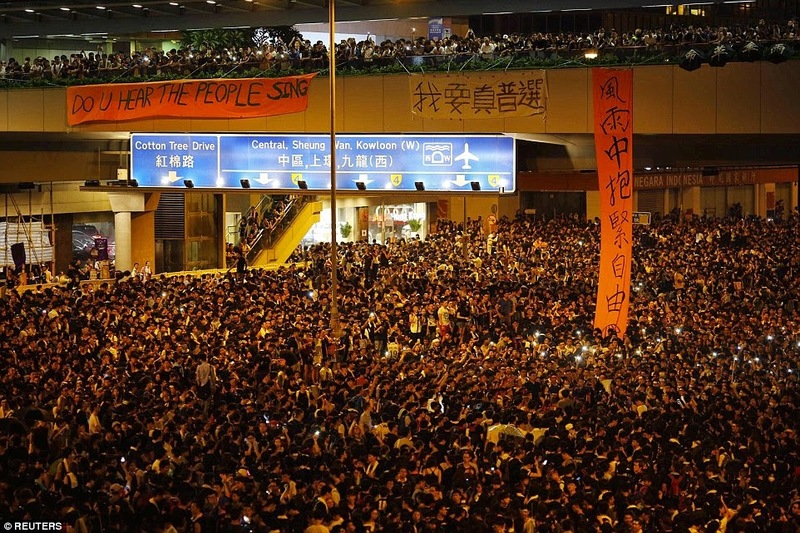 Watching the footage of bodies being spotted on TV, relatives of the ill-fated plane's passengers broke into tears and hugged each other as if silently sharing the grief, said an AFP report. 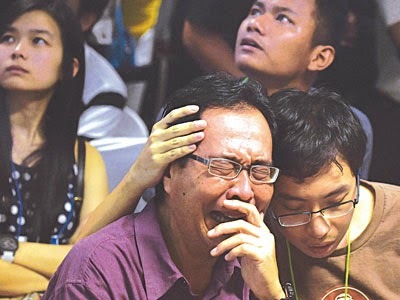 Families wept uncontrollably and one man collapsed as distressing images of bodies floating in the Java Sea were broadcast on Indonesian television. A shadow has also been spotted on the sea bed - thought to be no more than 30metres deep - believed to be the main fuselage of the Airbus 320. CEO of AirAsia Tony Fernandes said his heart is "filled with sadness" following the devastating news as he heads to a crisis centre in Surabaya. Search teams find dozens of bodies and debris floating in the Java Sea and officials are all but certain that they are from Flight QZ8501 - and that the airliner crashed into the water. Teams searching for AirAsia Flight QZ8501 have found more than 40 bodies along with debris floating in the Java Sea southwest of Borneo, and it is “95 percent likely” the objects are from the missing plane, Indonesian civil aviation officials announced Tuesday. At least three bodies were recovered Tuesday evening local time and a ship was dispatched to ferry the remains to the nearest city, probably in Kalimantan. Searchers reported seeinga large shadow on the seabed, suggesting the crashed jet has been located. Indonesian military aircraft and some ships spotted several objects, including an airplane’s emergency exit door, an emergency slide and square metal objects, as well as the bodies, floating in the sea, beginning around 11 a.m. local time, Bambang Soelistyo, Indonesia’s search-and-rescue chief said, at a press conference in Jakarta that was broadcast live. Other officials told reporters searchers also spotted a life vest and baggage in the water. Within hours the Indonesian Navy said dozens of bodies were being seen. After three days of intense searching, Indonesian officials say they think they've found debris from AirAsia Flight QZ8501 in the waters off the island of Borneo. 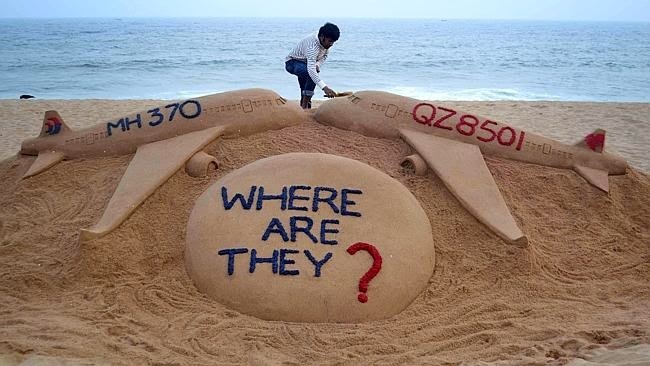 Objects spotted in the sea are "95% likely" to be from the plane that went missing Sunday with 162 people on board, Bambang Sulistyo, the head of Indonesia's search and rescue agency, said Tuesday. A search team on a plane spotted the shadow of an object that looked like a plane in the water. Further searching discovered floating objects believed to be the bodies of passengers, and then what appeared to be an emergency exit of the plane, Sulistyo told a news conference. As the search for a missing AirAsia passenger plane stretched into its third day, authorities widened their hunt and asked for outside help, even as hopes dimmed among families of the 162 people aboard the jet. Indonesian authorities said Monday they believe the plane already lies at the bottom of the sea, complicating the search and prompting them to ask the United States, Britain and France for more advanced equipment. INTERNATIONAL rescue teams are set to resume the search for AirAsia flight QZ8501 as families of those on board enter a third day of agony with little information to guide them. 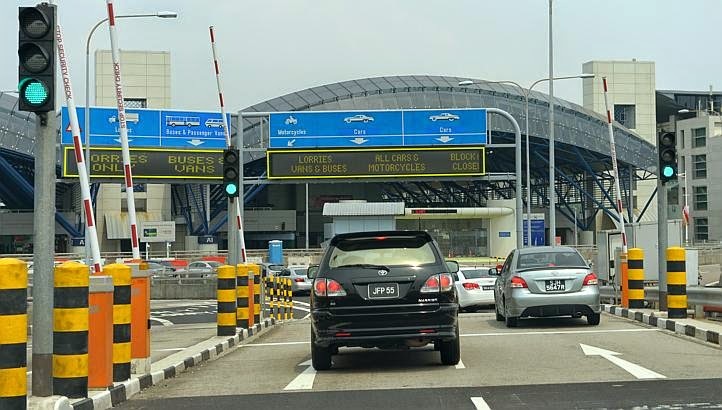 The plane, with 155 passengers and 7 crew on-board, has been missing since Sunday afternoon when it is believed to have flown into severe thunderstorms between Indonesia and its destination, Singapore. 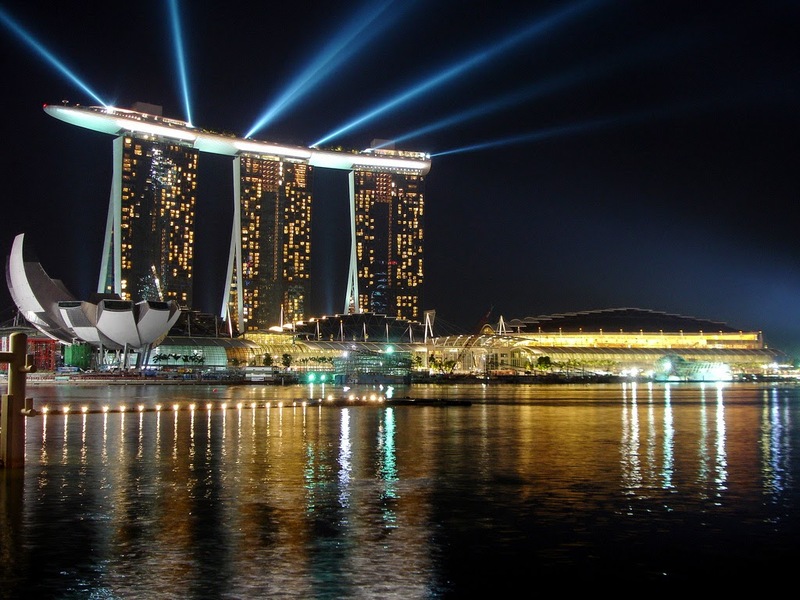 Twelve navy ships, five planes, three helicopters and a number of warships are taking part in the search, along with ships and planes from Singapore and Malaysia, and Australia’s Orion. 7.35AM: The US Navy has said that the USS Sampson, a destroyer, will be deployed. 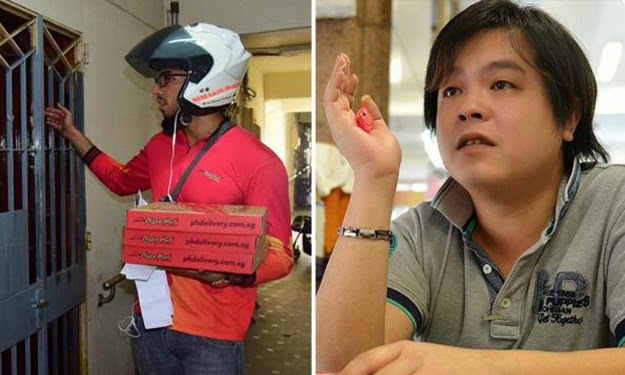 It is scheduled to reach the search area later on Tuesday. 7.07AM: The search for the missing plane has resumed on Day 3, Tuesday (Dec 30). 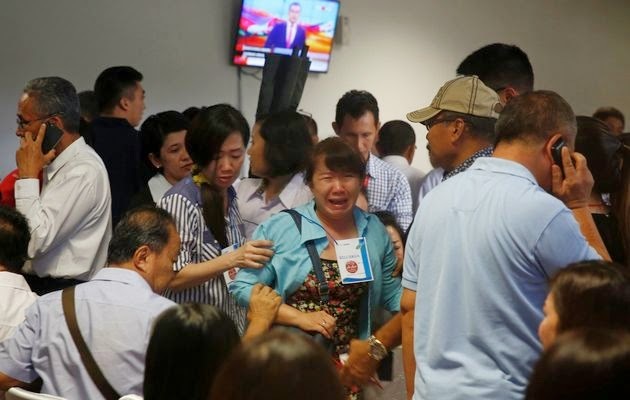 5.44AM: "Been one of my toughest days": AirAsia Group CEO Tony Fernandes has tweeted that he has spent a large part of the day meeting families of passengers and the crew, except for three families, that of the engineer, flight officer and one crew member. 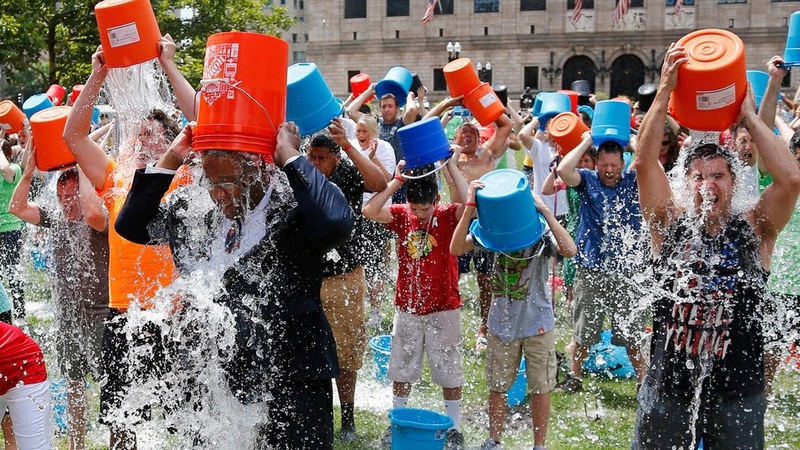 "The relatives of my crew were inspirational and so moving ... gave me huge strength," he said. An Indonesian helicopter saw two oily spots in the search area for the missing AirAsia jetliner Monday, and an Australian search plane spotted objects hundreds of miles away, but it was too early to know whether either was connected to the aircraft and its 162 passengers and crew, officials said. 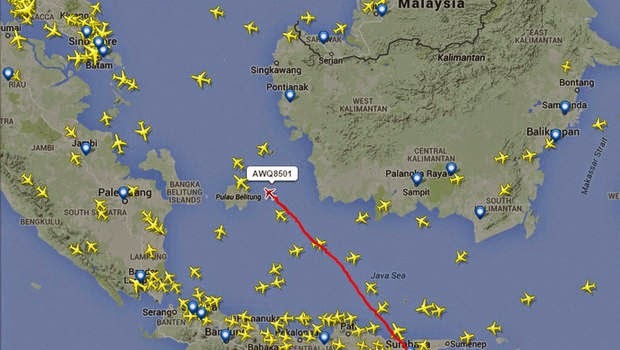 Flight 8501 vanished Sunday on a flight from Indonesia to Singapore. Earlier, a rescue official said the plane is likely "at the bottom of the sea." The search expanded Monday, with planes and ships from several countries taking part. Pope Francis prays for the passengers of the missing Asian airplane as hopes began to fade that anyone might be found alive. Even as Indonesia's vice president says his government is battling to find the missing passenger jet but relatives of those on-board face a second night of uncertainty. 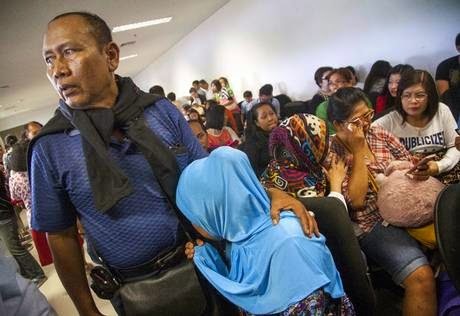 Dozens of scarlet-eyed family members packed into a cramped annex of Indonesia's Surabaya airport, where the flight took off early on Sunday morning, are desperately hoping for news. 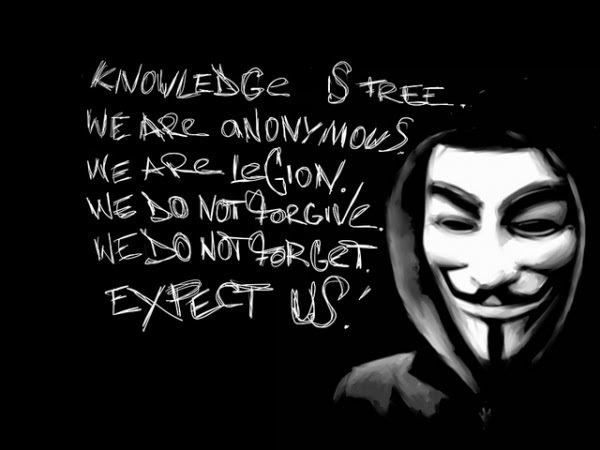 What is known about the flight and what possible causes will be investigated? Many Indonesian airlines are banned from Europe because of safety concerns. Is Indonesia Air Asia on that list? - No. It is one of five airlines specifically excluded from the blacklist. The EU has concerns about Indonesia’s airline regulators, but believes that Indonesia Air Asia maintains the highest standards of safety. Air Asia is a budget airline - which could lead to speculation about whether costs were cut in a manner that might endanger safety? 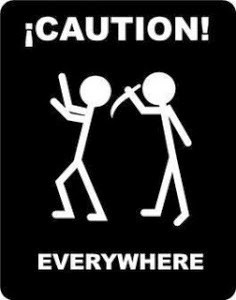 - There is absolutely no evidence that Air Asia or any other low-cost airline has done anything to compromise safety. Until now, Air Asia - like many other budget carriers - has had a faultless safety record. The aircraft is the third belonging to airlines based in Malaysia that has been lost this year. Is that significant? 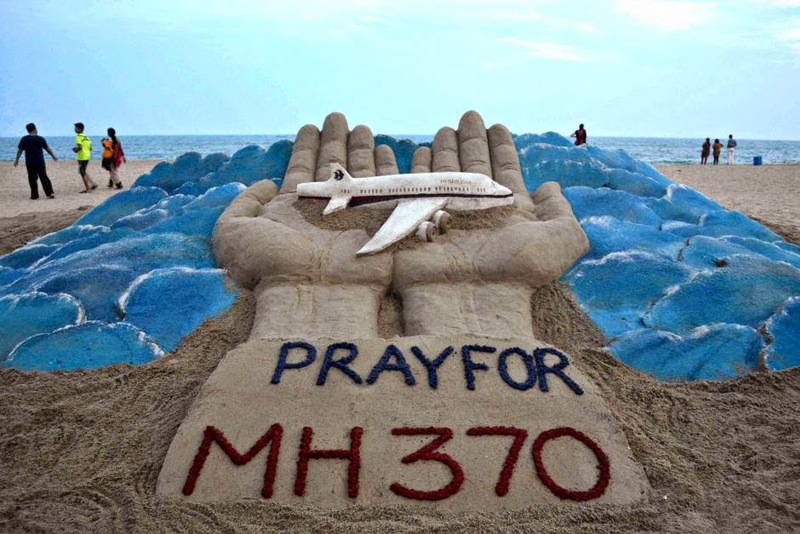 - It has indeed been a tragic year, with the loss - still unexplained - of Malaysia Airlines flight MH370 in March, the shooting down of flight MH17 in eastern Ukraine in July, and now QZ8501. 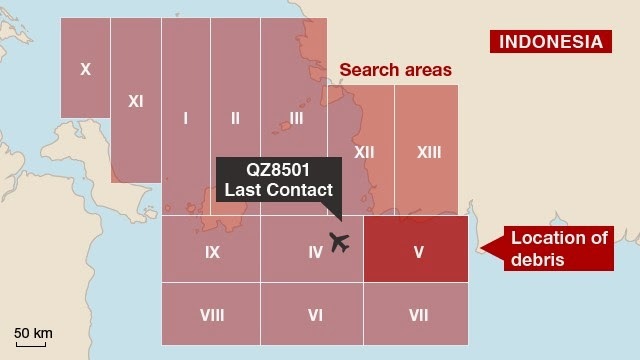 But no conclusions can be drawn - the first two disasters were unconnected, and there is no indication that QZ8501 has any connection apart from that awful coincidence. Whether or not there are survivors from QZ8501, 2014 has been the worst year of this decade so far in terms of passenger aviation. At first glance, the disappearance of AirAsia Flight 8501 echoes that of Malaysia Airlines Flight 370. The airline, and regional governments, have so far failed to explain how this happened, but the circumstances surrounding its disappearance, and the reaction of all involved, are shaping up to be very different, reports CBS News correspondent Elaine Quijano. AirAsia Flight 8501 left the Indonesian city of Surabaya bound for Singapore around 5:30 am Sunday morning. Approximately 40 minutes later, Indonesian air traffic control lost contact with the plane over the Java Sea. It sounds eerily similar to the disappearance of Malaysia Airlines Flight 370, which vanished last March en route to Beijing. But while some similarities exist, their trajectories are strikingly different. 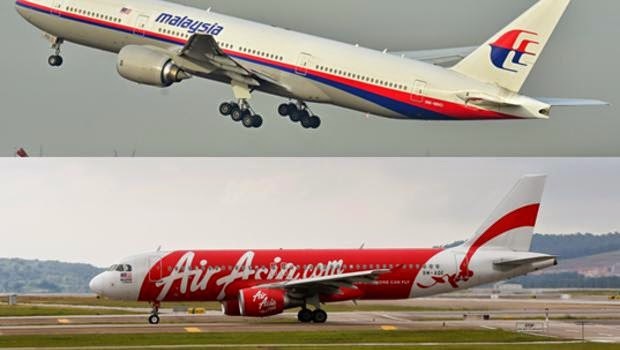 If the deaths of Flight 8501’s passengers are confirmed, Malaysia-based AirAsia and the nation’s only other airline, Malaysia Airlines, will have suffered the three deadliest aviation disasters of 2014. MH370: A Malayasia Airlines Boeing 777, en route from Kuala Lumpur to Beijing, disappeared on March 8 with 239 people on board. The plane's wreckage has not been found. MH17: Another Malaysia Airlines Boeing 777 was shot down over eastern Ukraine on July 17, killing all 298 people on board. 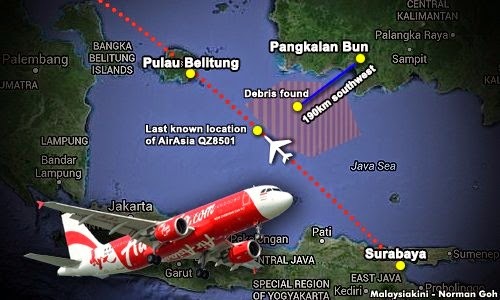 AirAsia Flight QZ8501, which is operated by Indonesia, lost contact with ground control on Sunday en route to Singapore after requesting permission to change route due to bad weather. Flight radar data shows the plane disappearing from the radar screen over the Java Sea on Sunday morning. There are 162 aboard, including one British national. Australia, Singapore and Malaysia have deployed planes and ships to assist in the Indonesian search for Flight QZ8501. 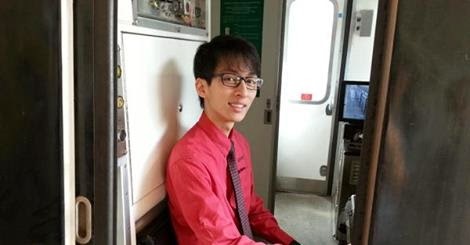 What happened to missing AirAsia Flight QZ8501? The search and locate operation for the missing Indonesia AirAsia flight QZ8501 will expand to land on Tuesday, the chief of Indonesia's search and rescue agency Basarnas told reporters late on Monday. "Search operations tomorrow will expand to land, to, among others, the western part of west Kalimantan province," said F. H. Bambang Soelistyo at a media briefing in Jakarta. He said the multinational operation involving from Indonesia, Singapore, Malaysia and South Korea would continue in the Java sea past dusk on Monday. Air operations will continue on Tuesday morning. 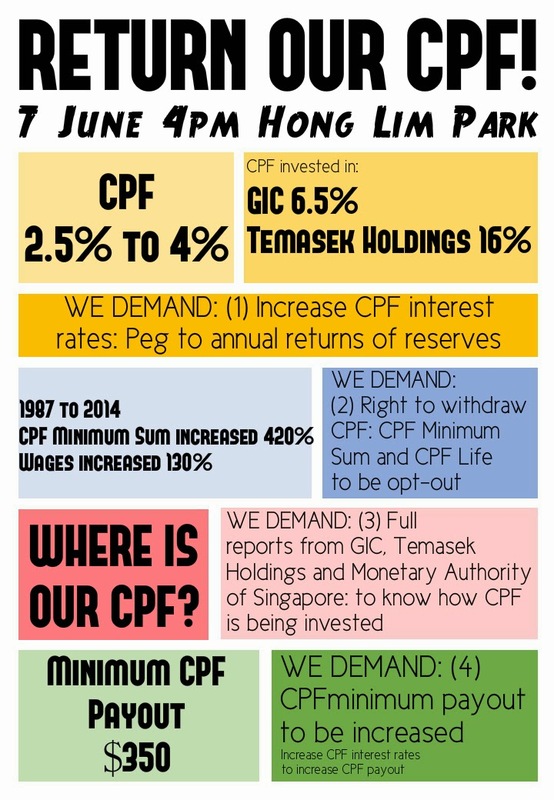 It is way too early to know for sure, but here are some options. The plane was in the safest part of flight: Just 10 percent of fatal crashes from 2004 through 2013 occurred while a plane was at cruise elevation, according to a safety study published by Boeing in August. Passing through bad weather such as severe thunderstorms could have been a factor. Airbus jets have sophisticated computers that automatically adjust to wind shears or other weather disruptions. But weather - combined with pilot errors - has played a role in past air disasters that occurred at cruise elevation, including the 2009 Air France Flight 447 crash over the Atlantic Ocean. Another possibility is some type of catastrophic metal fatigue caused by the cycle of pressurisation and depressurisation associated with each takeoff and landing cycle. This A320 had had 13,600 takeoffs and landings. Many occurred in humid climate, which speeds corrosion. Still, metal fatigue is unlikely because this plane is only 6 years old. NEWS.com.au: Who is Tony Fernandes, the AirAsia boss? Nigerian Tribune: Missing planes, air disasters: How bad was 2014? 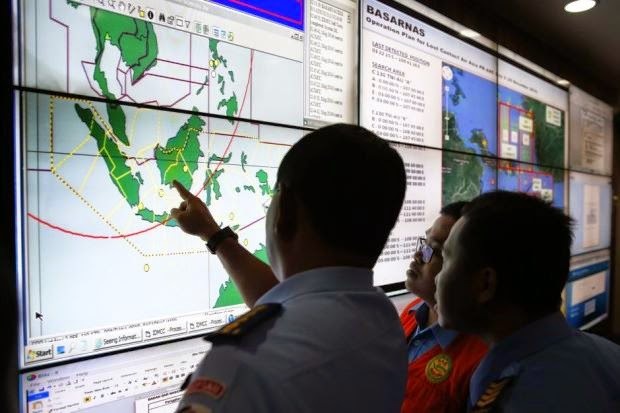 Herald Scotland: Indonesia says missing AirAsia plane could be at "bottom of sea"